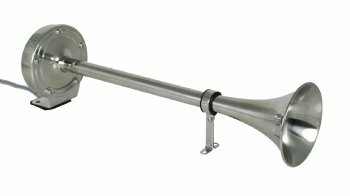 Marinco is the leading supplier of horns to the marine industry, with over fifty years of experience in designing and manufacturing sound devices specifically for use in harsh marine environments. Stainless steel is used for all critical components such as trumpets, motor cover, diaphragms, assembly and mounting hardware. In the case of the XLP trumpet horns, the horn is given extra protection through the complete over-molding of the internal motor cover housing. It is this extra process that provides the added protection needed to back up the five-year warranty.